Different groups of Scots adjusted to the changed status of their country in accordance with their own best interests. In Glasgow for instance, the opening to Scots traders of English colonies gave the merchants of the city the opportunity to amass great wealth from the tobacco trade between Britain and the plantations in the West Indies and the American eastern seaboard, Virginia especially. The 'Tobacco Lords' came to dominate the economy and the civic life of the city, their profits providing funds for investment in sugar and in cotton-processing and manufacture in due course. The new trading links with the New World were soon to alter completely the centuries-old trading pattern of pre-Union times, shifting the country's main commercial activity from the east coast to the west. From the early post-Union years until very recently, commercial and industrial Scotland centred on Glasgow and the Clyde. The effect upon Edinburgh was different, but equally striking. 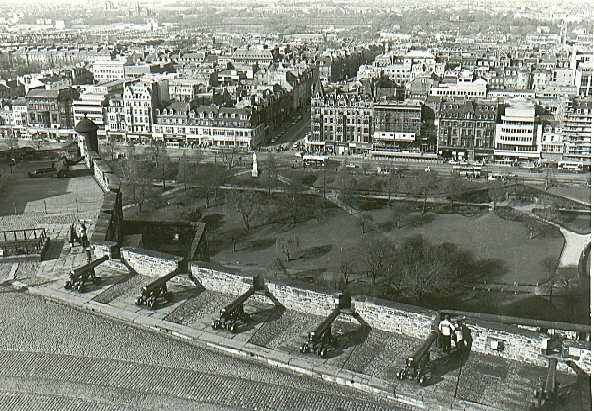 The loss of political purpose in the capital might have been expected to create something of a ghost town, but in fact Edinburgh flourished as never before. Its University in particular, like its sister institution in Glasgow, became a centre of excellence in a whole range of studies - arts and sciences alike. Scottish philosophers, like David Hume and Adam Ferguson, were recognised throughout Europe and America as the foremost original scholars of their time. Edinburgh came to be called 'The Athens of the North', and the city enjoyed an intellectual and cultural 'Golden Age'. Physically the city was transformed, thanks largely to the vision and energy of George Drummond, a leading figure in local politics and Lord Provost for several terms. Buildings designed by architects of international status gave grace and dignity especially to the New Town, built across the newly drained Nor' Loch; and the New Town became Scotland's finest example of the expression in stone of the spirit of the age. That spirit is summed up in terms like 'The Age of Reason' or 'The Enlightenment'; terms which remind us that the eighteenth century saw a flowering of human imagination and talent unsurpassed since Renaissance times. Just as then, in the fifteenth century, so again in the eighteenth, men drew inspiration from classical examples. In architecture, in philosophy, in literature and the arts, even in gardening, emphasis was upon symmetry and order. The inspiration was scientific. Scientists observed that the world operated in accordance with rules which Mathematics and Physics could test and prove. The notion that the world was essentially founded on harmony and order encouraged the desire to show form and order in all human artefacts, and encouraged also the optimistic belief that life and society could similarly be planned and ordered if only men would use their intelligence. There developed an optimism; a confidence that Man by the exercise of his intellect, could improve himself and his institutions, and perfection itself was not an impossible goal. It was all a far cry from the conflicts and emotionalism of the seventeenth century, but the obsessions and issues of that period had ceased to be relevant. The preoccupation with church government had lost its urgency with the settlement of 1690; while the old magic, mystical monarchy by Divine Right had gone with the Stewarts, and King William and King George were magistrates and administrators, rather than embodiments of God's will. The new age would, however, have been unlikely to come to birth but for one further consequence of the Union. The aristocracy - the 'natural leaders' of the Scottish political community - had not abandoned their political ambitions or their taste for public life. There was now a new state to be served and a new, richer paymaster, from whom rewards for service might be expected. Those who would be courtiers had to go to the Court, and the Court was now in London. So to London went the Scottish aristocracy. With that regard to the interests of their descendants, which is an acquired characteristic of aristocracy, the Scottish nobles now saw to it that their sons would in future be educated, according to English usage, in England, from whose schools and universities the English state had drawn its servants, just as the new British state would assuredly do. By residence, by up-bringing, by social contacts, by participation in public affairs, the Scottish aristocracy became thoroughly integrated, within a generation indistinguishable from their English colleagues. They deserted, more or less en masse, the people they had led and the culture which with them they had shared. Into the social gap thus left, there came the new men of significance, their claims to power and influence resting upon their talents and their intellect and not upon their pedigree or their acres. The new men were lawyers, university professors, leaders of professions and men distinguished by success in commerce. These men were preoccupied by the wish to construct and to improve. Diplomacy and statecraft now belonged to London, and Scotland's new men were concerned with the intellectual and commercial activities which remained in the Scottish community. The vigour and influence of Scottish cultural life was spectacular, and not merely in the abstract. Practical consequences flowed from the theories and ideas which abounded. However, before these practical developments could fully come to pass, Scotland had to pass through one last crisis, one last expression of the old seventeenth century controversies. It was to be expected that some attempt would be made to set aside the Act of Settlement in order to secure the restoration of the branch of the royal family which had been excluded by Parliamentary decision, but which was, by blood, the rightful line. Such attempts were now made by the supporters of the old traditional monarchy to bring to the throne James Francis Edward, son of the ousted King James (who had died in exile in 1701). For thirty years Jacobite hopes endured, bringing about more or less constant diplomatic negotiations and political intrigues, and, in particular, two armed risings aiming at the restoration of the Stewarts. The attempts concentrated especially upon Scotland. Support for the Jacobite cause in England was negligible, but in Scotland emotions were more extreme and more contradictory. In most of the Lowlands the Stewarts were hated and feared, though some families among the nobility and gentry, mainly because of Episcopalian or Catholic commitment to Divine Right, were sympathetic. In the Highlands support was proportionately rather greater. The Campbells were Presbyterian and Hanoverian, and this had the effect of making clans who were their neighbours and victims - usually the same thing - take the opposite side. So Macleans, Stewarts of Appin, Camerons and MacDonalds of various septs, were receptive to Jacobite appeals, to which in any case the religious views of the chiefs of these various clans inclined them. Further north, away from Campbell pressures, there was less interest. Mackays, Sinclairs and Gunns were as Hanoverian as the Campbells, and the Mackenzies were not especially interested one way or the other. So the balance of opinion in the Highlands was fairly even, with perhaps, if we exclude Clan Campbell, a slight tendency towards Jacobitism. In the country as a whole there was no doubt that the exiled line was opposed by a substantial majority. The point was, however, that, given the military potential of the clans, Scotland might just possibly be won for the Stewarts on the battlefield. Thus Scotland became the focus of Jacobite attention; and Scottish national grievances and hurt were played upon by Jacobite supporters. 'Scotland and no Union' became a Jacobite slogan which men were in due course to inscribe upon their swords. Some Jacobite response was to be anticipated after the accession of George I in 1714. To strike before the new regime in London had been properly settled in, and while irritation against the Union continued in Scotland, was an obvious tactic, and as soon as plans could be devised, a rising duly occurred, beginning with the raising of the standard of King James VIII, by John, Earl of Mar on 6 September 1715. The rising was ineptly led. Border Jacobites - Lord Kenmure in Galloway, and the Earl of Derwentwater in Cumberland - marched rather inconclusively in the North of England, until surrendering at Preston. 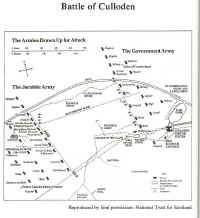 Mar failed to make any well-timed or really persevering attempt to break through to Edinburgh, allowing himself to be blocked by an army a third the size of his own, led by Argyle, at Sheriffmuir on 13 November. By February 1716, Mar and James himself, who had landed too late to contribute anything much to his cause, were both in exile. Jacobite prospects had been adversely affected in 1715 because French policy at that moment was not supportive. That policy, however, changed; by 1743 France was at war with Britain, and her rulers readier to pursue their traditional policy of encouraging disaffection which would divert British attention and power from the continental war. Thus James's son, Charles Edward, received a more encouraging response when he proposed to lead a further rising on his father's behalf. The French were never able to bring themselves to give all-out support to such enterprises, but on this occasion they did provide Charles with money, supplies and some seven hundred soldiers with which he set sail in a two-vessel fleet from Nantes in July 1745. One vessel was driven back to France after an encounter with a British warship, and it was with only seven men and no material French support that Charles landed in Eriskay on 23 July. His obvious weakness deterred chiefs who had been making Jacobite noises, but appeals to loyalty and honour from Charles won over Cameron of Lochiel, and his example brought others round. On 19 August Charles raised his father's standard again at Glenfinnan; and in due course the clans of the west-central Highlands - Cameron, Stewart, MacLean, MacDonald and various branches of Clan Chattan - together with the Episcopalian and traditionally loyalist aristocracy and gentry of the North-East, Angus and Perthshire, joined the Prince. In September Charles took Perth and, a fortnight later, Edinburgh. General Cope, who had allowed himself to be panicked out of trying to hold Charles's advance north of Perth, had brought his army by sea from Aberdeen to Dunbar, and now marched to the relief of Edinburgh. On 21 September an early morning attack by Charles at Prestonpans shattered Cope's army and left Charles triumphantly to return to Edinburgh where for some weeks he held court in Holyrood while the city became again the capital of a country over which England's rulers held no authority. The Jacobite triumph was short-lived. Moving into England Charles attracted virtually no support. For a time the best strategy seemed to be for the Jacobites to press on towards London, where an unseemly panic developed among the great but unwarlike financial and political personalities. But facing a growing government force to the south, and menaced to his left and right by other armies, Charles had to give way to the advice of his officers - especially the one truly competent general among them, Lord George Murray - and retreat from Derby back to Scotland began on 'Black Friday', 6 December. 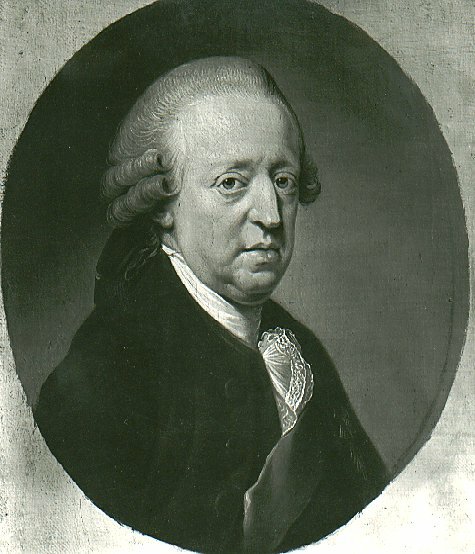 A revolutionary army on the retreat must always fall prey to anxiety and loss of morale, and so it was with Charles's force, weakened by desertions. It was still a formidable instrument, capable of inflicting a sharp defeat upon General Hawley, who pursued it too closely, at Falkirk on 19 January. It had some moral successes too. When the army camped overnight near Stair Castle, home of the Dalrymples, there were those who thought of taking a modest revenge upon the property, but a guard was mounted by the MacDonalds of Glencoe who thus saved from destruction the house of the man responsible for the massacre of 1692. Then again, as the Jacobites passed through Glasgow it seemed very likely that that Presbyterian and Hanoverian city might suffer for its politics, but Lochiel exerted such discipline over his soldiers that no violence was offered to the citizens or their homes. 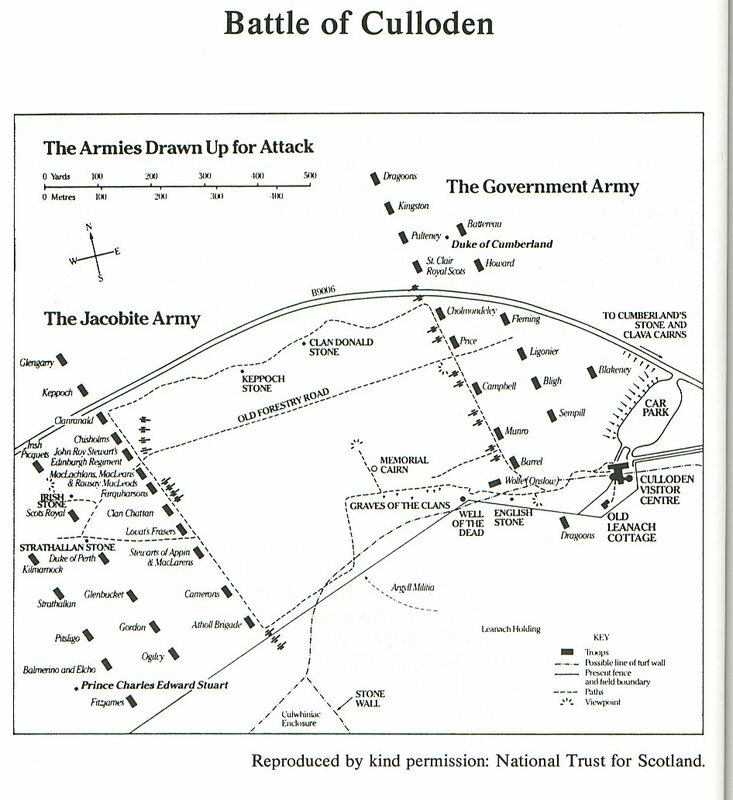 Retreating ever northwards, pursued by the government army under the Duke of Cumberland, the Jacobite army was eventually forced to fight a pitched battle at Culloden, where on 16 April the exhausted and half-starved men in its ranks fell victim to the artillery of Cumberland, the survivors perishing in one last desperate sword-wielding charge on the enemy lines. Charles spent an adventurous year as a fugitive, protected by the loyalty and devotion of many Highlanders, until able to secure rescue in a French ship and thus escape to face the rest of his life as an exile. For the Highlanders who had followed him, the suffering did not end with the deaths under the guns at Culloden, or at the hands of the punishment squads of Cumberland the Butcher. The whole Highland way of life was now to perish, as Parliament in London devised laws which would ensure that the events of 1745-46 could never happen again. A Disarming Act legally stripped the clans of their weapons, and bagpipes and Highland dress were banned for good measure. The clansmen, who had provided the chiefs with a military capacity were no longer soldiers in waiting, or at least not on behalf of their chiefs. The Tenures Abolition Act destroyed the bond of military service between chief and clansman, and the Heritable Jurisdictions Act took from the chiefs their virtually sovereign powers over their tenants. The Highlands would now be subject to the same laws and procedures as all other parts of the British state. 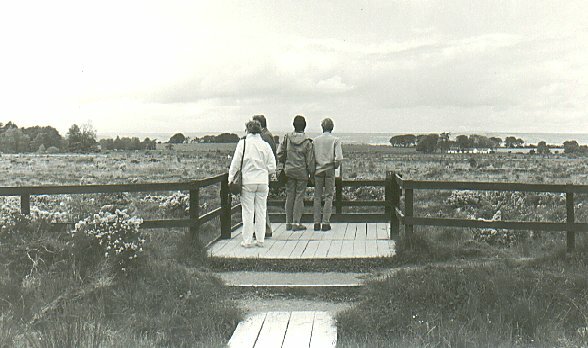 During those years while the Jacobites had been hoping, planning and fighting, life in the non-Gaelic parts of post-Union Scotland had been proceeding largely unaffected by these excitements; because, with the obvious exception of the great expansion of American trade, the development of the Scottish economy had not been vitally affected by the Union at all. When the century began, Scotland, like most of Europe, displayed all the characteristics of what would today be called an under-developed country. Nine out of ten people lived by working on the land, using methods virtually unaltered since the Middle Ages. Land was cultivated at subsistence level; its produce to be eaten rather than marketed. Such profits as the system produced went to those who owned the largest estates; and these men used their wealth, generally speaking, in self-indulgence. Brandy on their tables; silver on their garments; a coach on their terraces or another turret on their dwellings, all too commonly were preferred to financial foresight or worthwhile investment. But the Enlightenment had a practical side to it, and the successful lawyers, academics and merchants who had emerged as the new rising class had, in many cases, marked their success in the traditional fashion - they bought land. Sometimes they found that the gentry were not willing to part with their land, but usually the market provided enough to cater for the ambitions of the new rich; and sometimes, even if purchase was impossible, marriage into aristocratic families would provide entry into the landowning world. For these men, and for some of the traditional gentry, the scientific improvement of their estates was a favoured expression of intellectual vigour. If it was true that man could, by his own wits and energy, make his world a much more rational and comfortable place, where better could an intelligent man set out to prove his point than on his own land? There was an economic incentive too. As the eighteenth century proceeded, a rising birth rate was creating a demand for food which agriculture, using traditional methods, could not meet. Thus intellectual promptings and commercial expectations combined to encourage efforts to increase the productivity of the land. In 1723 there was established the Society of Improvers in the Knowledge of Agriculture. The Society's members sought to encourage and sponsor experiment, and to circulate advice and reports of good agriculture practice. Their Secretary, himself a laird, Robert Maxwell of Arkland in Galloway, was outstandingly energetic in seeking to inspire and inform his three hundred or so colleagues. The Society produced a series of publications urging change, and advising as to how and where changes could be made. The organisation of the land - the old infield/outfield system, and its communal 'runrig' working - should be replaced by enclosure, and long leases granted to encourage effort. Walls or hedges and tree plantations would provide shelter from the elements as well as protection against straying animals. The soil could be drained, cleared of peat and moss, fed with lime; thus treated, more acres could be brought into cultivation, and those already in production could be enriched. At this early stage these activities tended to be the hobby of enthusiasts rather than the general practice of the country, and indeed the Society itself ceased to function from around 1750, by which time some Improvers had over-reached themselves. Some ideas, drawn from England and Europe had not been really feasible on Scottish soil or in the Scottish climate. Cockburn of Ormiston, who, like his neighbour, Clerk of Penicuik, was a typical Improver, bankrupted himself in his enthusiasm, and had to sell his estate. So, progress was not smooth, but it did endure, and the enthusiasm and interest of the Improvers was to prompt and inspire landowners into enlightened estate management throughout the rest of the century. Landowners and tenant farmers alike joined in draining and weeding, treating and protecting their fields, sponsoring and purchasing new items of equipment which inventors were offering. The mechanisation of farming processes had made progress in England, and Scots farmers were increasingly using improved ploughs, seed drills, harrows and reaping and threshing machines. James Small's plough, perfected by about 1765, made extended cultivation possible, and reaping and threshing machines, devised by Patrick Bell and Andrew Meikle, made harvesting much more efficient. Over these improvements, throughout the eighteenth century and into the nineteenth, there presided practical theorists like Lord Kames, typical of lawyer-landowners; Lords Gardenstone and Monboddo; Sir John Sinclair of Ulbster and Grant of Monymusk - all of them, and many others, practising new techniques, and encouraging innovation. New rotation patterns were introduced, helping to ensure that land could remain more or less constantly in production, and the longer leases offered by landowners encouraged tenants to match the enthusiasm of their landlords. The yield of the land - the ultimate indicator of success - was improved substantially; and, in stock-farming, selective breeding increased the average weight of animals four-fold, and their value five-fold. Closely associated with agriculture were the crafts and industries which used the produce of the land as their raw materials - wool and linen for instance. These industries had been supported, from the early part of the century, by bounties and premiums paid out by the Board of Trustees for Fisheries and Manufactures, founded in 1727 (rather belatedly, as a body of the sort had been promised in Article 15 of the Treaty of Union). Throughout the century the Board acted to provide incentives for production in bounties and prizes; training for intending craftsmen and women; experts to train Scots in specialised continental methods, and encouragement to mechanisation. As in agriculture, so in these textile industries, success was proved by the vastly increased output. In the chief linen-producing areas, Fife and Angus, for instance, linen output rose from under one million yards in 1728 to over thirteen million by 1788. The processes involved in linen production were made more speedy and more efficient by rapid mechanisation. The flax plants, used in linen-making, had to be 'retted' in ponds or pits, where the soft parts of the plant would rot away, leaving the tough stems and fibres. These then were 'scutched' - pounded or beaten - to soften the woody stems, and finally 'heckled' or combed, to thin out the fibres and make them ready for spinning. All these processes were traditionally carried out by hand, but water-powered machines were devised and installed in 'lint' (i.e. flax) mills which numbered some two hundred and fifty by the 1770s. Spinning and weaving were revolutionised by the engineering ingenuity of Hargreaves, Arkwright and Crompton in spinning, and Kay in weaving. The old handcraft wheels and looms were superseded by machines powered, first, by water, and eventually by steam. In 1790 the Board of Trustees received a petition from James Ivory of Kinettles near Dundee, asking for the Board's patronage and support for his purchase of 'one of the patent machines for spinning linen yarn to go by water.' In 1794 Alex Aberdein and Co. in Arbroath had followed Ivory's example. Within thirty years there were seventeen spinning mills in Dundee alone and another thirty-two in nearby Angus villages. Around the linen industry, pioneering in mechanisation, there also developed ancillary industries and services. Dyeing and bleaching developed in Perth; and the British Linen Company, formed to organise credit facilities for the industry, became in due course a bank, rather than a producing company. The pattern set in the linen industry was repeated in the later development of the cotton industry which developed especially in the Glasgow and Clydeside area, from just before 1780. Cotton was the most adaptable of cloths. It could be combined with linen if that would seem likely to produce the kind of material required. It could be produced in a variety of qualities, heavy and useful for domestic furnishings, or in quality which compared with the finest linen. It was more easily processed than linen, and in due course, by the mid-nineteenth century, came to be the main textile produced in Scotland. Mechanisation of industry had very far-reaching social consequences. The new machines were expensive, and beyond the pocket of most of the spinners and weavers who had kept cloth-making going as a home-based 'cottage' industry. Also, the machines were bulky, and really required special premises. For these reasons the industries passed into the hands of specialist owners, who could buy the machines and build sheds in which to instal them, thereafter paying workers to come and operate them. These 'manufactories' had to be built near the source of power - running water to begin with, and then near coal-fields when steam-power came to be used. The workers had to follow the work, and the owners of the machines and 'factories' (the shortened version of the original word) began to provide housing near the workplace for the convenience of the workers. So it came about that the old independent handloom weavers, and domestic spinners, working to commissions or contracts in their own homes, were superseded by two very different groups - the owners of machines and premises who controlled production, and the paid employees who carried it out. Thus emerged the new classes of decision-making owners, living off the profits of their industries, and wage-earning workers, operating to instructions and under supervision. Obviously the interests of these groups would clash, especially as workers sought to maximise wages and owners sought to maximise profits. The owners were, in many cases - perhaps most - men of humble social origins themselves, with no tradition of aristocratic sense of obligation to their dependants. They were frequently insensitive, sometimes cruel, and their view of their workers created a social problem which came to loom large in the political arguments throughout the rest of the nineteenth century and beyond. One exception to the general rule was the cotton producing complex at New Lanark, founded by David Dale and Robert Owen, well-known for his unusual enthusiasm for social experiments. Owen and Dale believed that workers who were well-treated, and who worked in healthy and comparatively pleasant conditions, would produce at least as profitably as those who were under constant threat and compulsions, working in conditions devised in such a way as to cost the owners next to nothing. 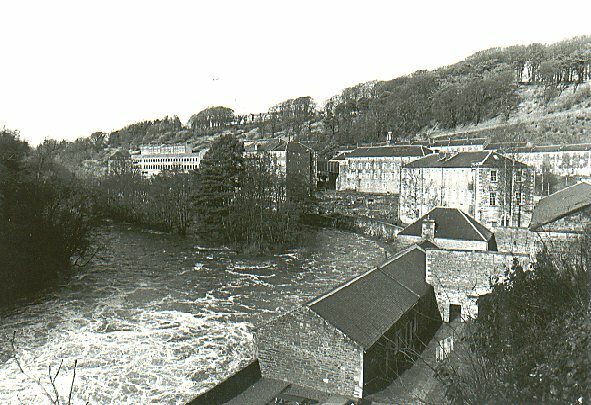 New Lanark had a school, and leisure facilities for its workers, and became a work place of international fame for its attempt to humanise the new industrial relationships. Fundamental to all these developments were the industries of coal-mining and iron-founding; coal to fire the boilers which produced the steam which drove the engines; coal to heat the furnaces in which iron was smelted; and iron to provide the frames, rollers, cylinders and pistons from which the new machinery was made. An iron industry had long existed in Scotland, using imported iron ore smelted in furnaces heated by charcoal, which was in turn produced from Scottish forests. For this reason the earlier ironworks were in, to modern eyes, rather surprising places - at Invergarry, on Lochfyneside, and, most famous of all perhaps, at Bonawe, where the birch forests by Loch Etive fuelled the fine iron works. The industry in the lowland areas took its beginnings from the creation of the great works at Carron, near Falkirk in 1759. There charcoal was fairly quickly replaced by coke, and Carron became the great centre for the production of ironware from simple domestic goods to heavy guns. 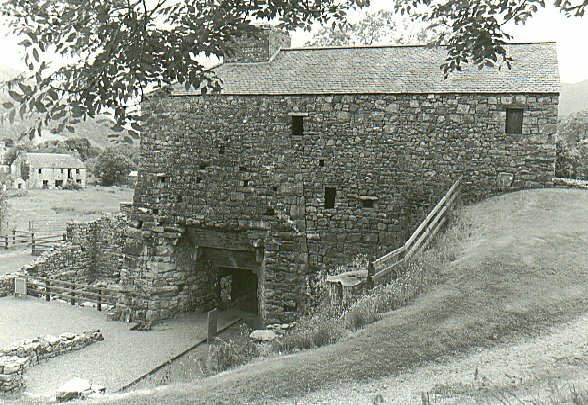 The wars of the eighteenth and nineteenth centuries provided the demand for iron which kept Bonawe and Carron busy. Opportunities for profit encouraged others to enter the industry, and ironworks at Muirkirk and Wilsontown followed. When, in 1828, J B Neilson devised a new type of furnace which could use Scottish iron-ore, the industry saw further expansion in the Lanarkshire and Glasgow area. the laboratory technician James Watt, was beyond doubt the most vital contributor of all to the new age of production, having made it possible for steam engines to operate with the degree of efficiency which made all the rest possible. So eighteenth century Scotland was profoundly changed from the Scotland of the past. It was no longer a nation of rural workers and landowners, but increasingly a nation of town-dwellers and capitalist employers. It was now a nation whose future lay with Carron, not with Culloden; a nation whose appropriate emblem was not the White Rose of the Jacobites, but the blue flower of the flax.